Please contact me regarding the 2015 Felling FT-70 - Stock# 003289 for sale at TruckerToTrucker.com. 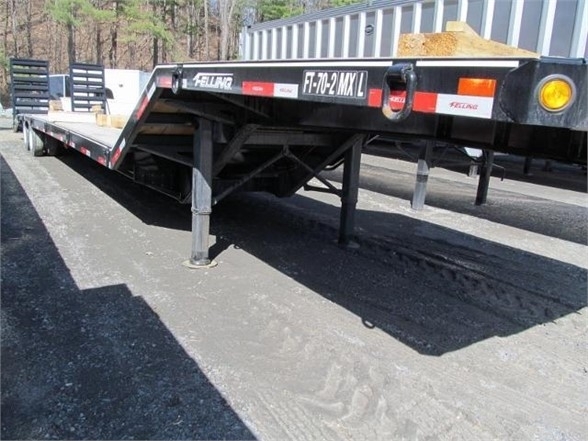 Take a look at this 2015 Felling FT-70. It is Stock# 003289 at TruckerToTrucker.com. LOAD CAPACITY 70,000 LBS DISTRIBUTED, 45,000 IN 10FT, 41,500 LBS IN 4FT UPPER DECK 90% NECK MAIN DECK LENGTH 28FT CHANNEL SIDE RAILS TURNED IN SELF CLEANING 5 X 3 ANGLE IRON BEAVERTAIL DECK TYPE: 6 JR I-BEAM CROSSMEMBERS. 16 ON CENTER REAR RAMPS: 5'X20 SELF CLEANING 5 X 3 ANDLG IRON SPRING ASSISTED APPROX DECK HEIGHT: 59 UPPER DECK 35 MAIN DECK LOADED TIE DOWNS: = 16 D-RINGS 1 STRIGHT BRAKES: AIR, ABS 2S/1M MERITOR WABCO AXLES: 25K MERITOR OIL BATH SUSPENSION: 49 SPREAD (SPRING) 9700 HUTCH HITCH TYPE:SEMI KING PIN WITH 18 SETBACK. HOLLAND MARK V (62,500 LB LIFT CAPACITY) COLOR : BLACK G.V.W.R. 82,500 CALL FOR MORE INFORMATION & PRICING TODAY!